With a brilliant race, Aleix Espargaró rode his Aprilia RS-GP to a sixth place finish in Aragón. It was a performance worthy of a protagonist. Aleix battled consistently just behind the leaders and, an even more important result, he finished six seconds and nine tenths behind Marquez, just behind Valentino Rossi and ahead of Dovizioso, so battling with World Title contenders. This is the best race performance yet for the fledgling RS-GP. 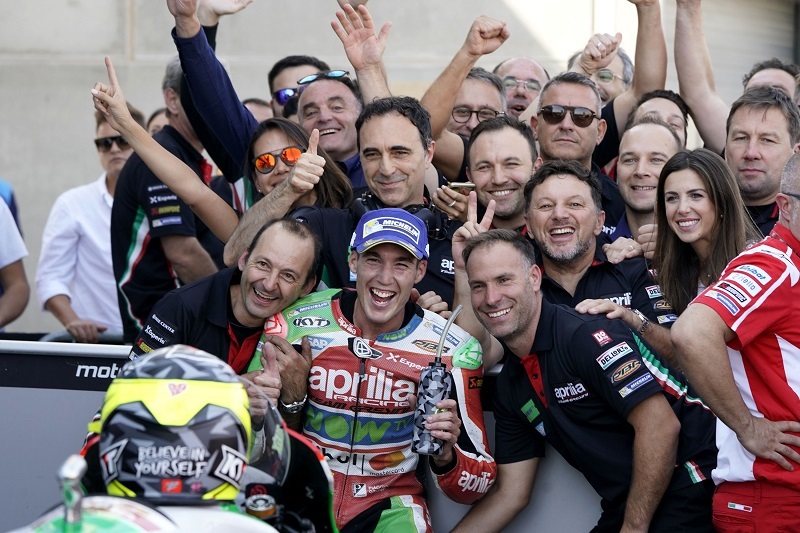 It is a result that dispels any doubts about the potential of the Italian team who, on a long-awaited trouble free weekend, was able to fully express their skills, highlighting in the race all the progress made by the youngest bike on the grid. This nice result is the cherry on top of a weekend where Aleix was consistently in the top ten. It was clear from this morning that Aleix and his Aprilia were in grand form when the number 41 rider finished the warm up session in second place with only Marquez ahead of him. In the race, starting from the eighth spot on the grid, Espargaró lost a few positions at the start, dropping back to twelfth place. From there, a great comeback ride began in which he moved up to ninth place already on the first lap, then battling constantly in the group that was trying to chase down the race leaders. Overtaking Kallio, Bautista and finally Dovizioso, Aleix earned his final placement, in addition to the satisfaction of taking home the fifth best race time. Sam Lowes, certainly not helped by the few sessions held on dry asphalt, finished twenty-second, missing the points zone which is still his primary objective.